From drought and heat in the summer to snow and heavy rains in the fall and winter, the weather in northeast Oklahoma can cause significant shifting in the soil around your foundation. 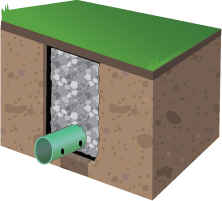 Proper drainage ensures more even soil conditions throughout the year, helping prevent lifting & settling of your foundation. French drains help remove sub-surface water from around a home’s foundation. French drains are an effective and time proven solution to water drainage issues. When applied and installed correctly, they can handle large quantities of water for many years. These drainage methods use solid drain pipes to move water away from your home. This method of re-grading your property allows surface water to be redirected away from the house foundation and channeled to a point where it does not pond. Note: If your drainage problems are severe, then a combination of these methods may be used.